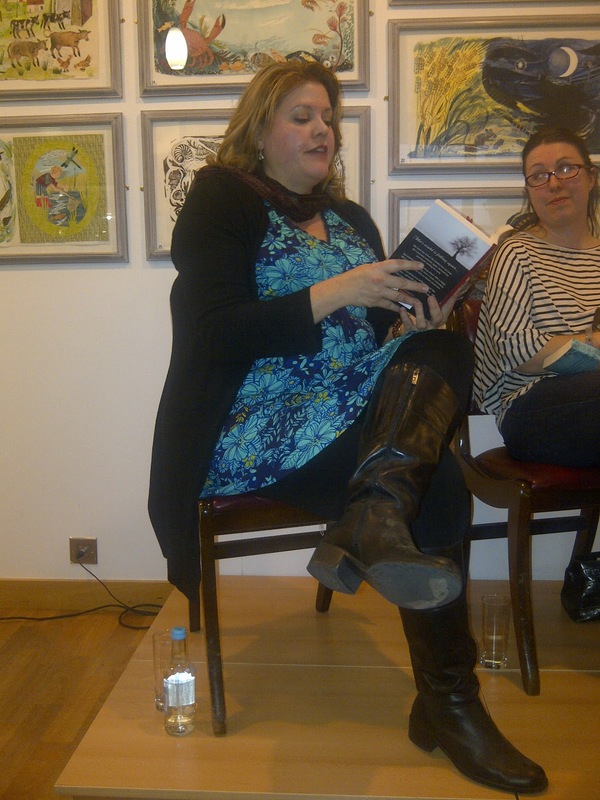 Last week I managed to get tickets to the Foyles (Charing Cross) event 'Creative Voices' which allowed bloggers and readers access to some amazing authors. Foyles have another two events coming up like this and I would highly recommend them if you have an author you really wish to meet. As typical bloggers, we arrived their waaay to early and as everyone knows, bloggers should not be allowed to roam around unattended. Look what happens! We pretend to be authors! From left to right, Lucy (Choose YA), Casey (Darkreaders), Leanne (District YA) and Laura (Sister Spooky). As the room began to fill up, we became much more professional and waited patiently.You can just see Caroline from Big Book Little Book supplying us with American M&M's! I had been really looking forward to this event, because it meant that I finally could meet Amy Plum. You may remember last year that I made a heart felt plea via a blog post for a spare copy of Die For Me by Amy Plum, which I got! I loved it and began to chat regularly with Amy via Twitter, so I was extremely excited to discover that she was finally coming to the UK. I drove everyone mad with my excitement! Amy wasn't alone on the stage. 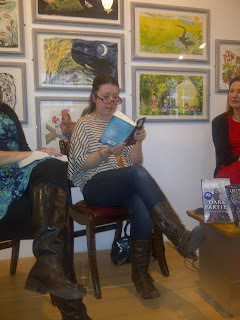 She was accompanied by Sara Grant, author of Dark Parties, Ruth Warburton, author of A Witch In Winter and C.J. Daugherty, author of Night School. I felt like such a book swat as I had not only read all the books being talked about, but I also had them all signed already apart from Amy's books! 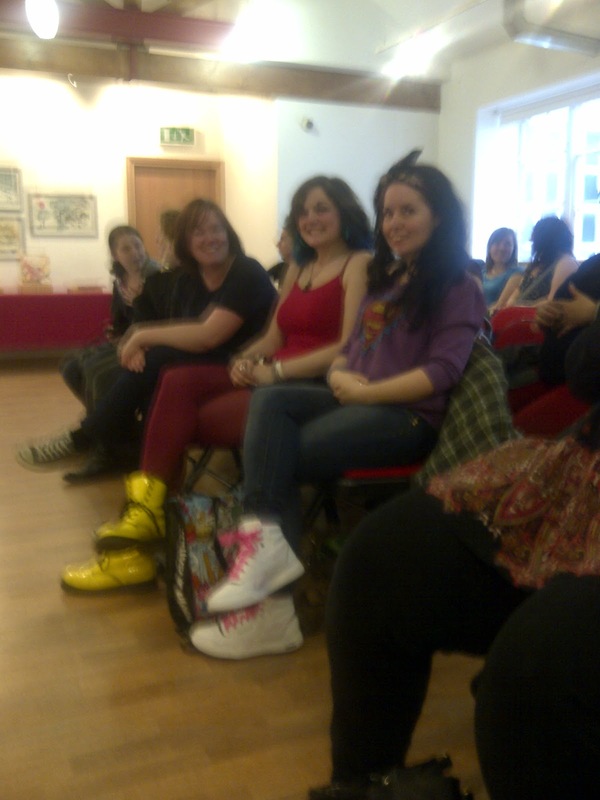 When Amy began to address the audience, she told me she recognised me straightaway! I was sooo happy! Each author began to tell us a little about their book, followed by a passage from it. 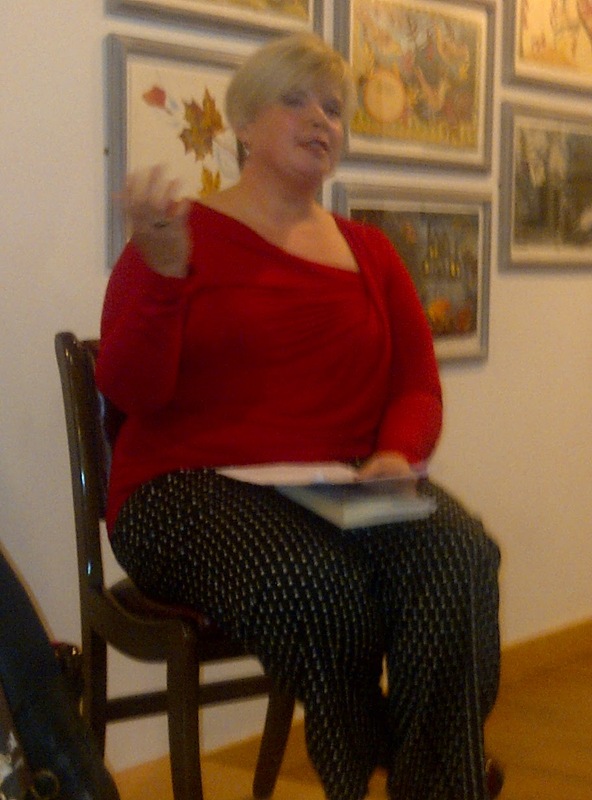 Sara Grant really inspired me after she mentioned it took 17 years to get published! There is hope for me yet. 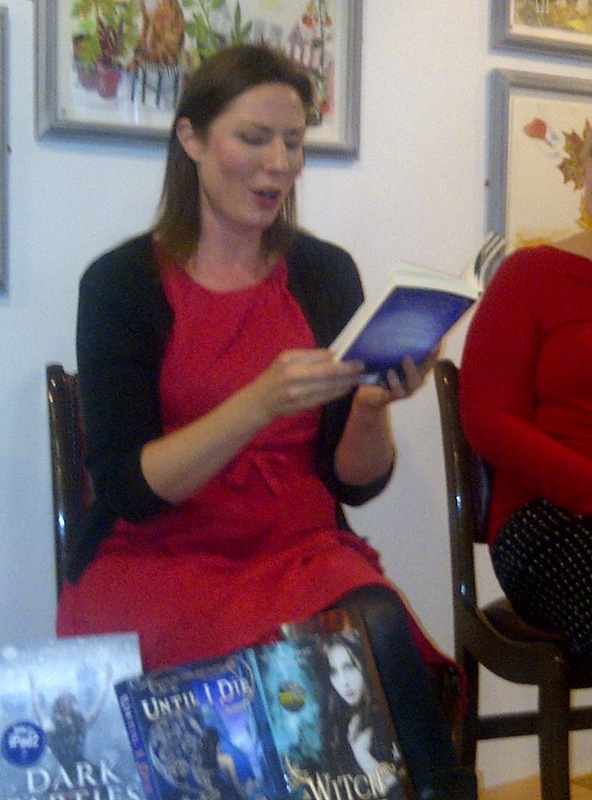 Ruth Warburton made me laugh, when asked whether she wrote full time. She replied that she didn't, but her book had allowed her to have new windows fitted in her house. C.J. Daugherty also admitted to a long journey to publication too. Afterwards we managed to get books signed by the author. I was straight in the queue for Amy Plum. Although I have to admit, I got extremely tongue tied when I got to the front of the queue. What do you say to someone you have been dying to meet?? Next time I meet Amy I shall have a list of questions ready. It was a brilliant evening and I was so happy to see that Amy Plum mentioned us personally in her blog post the next day. 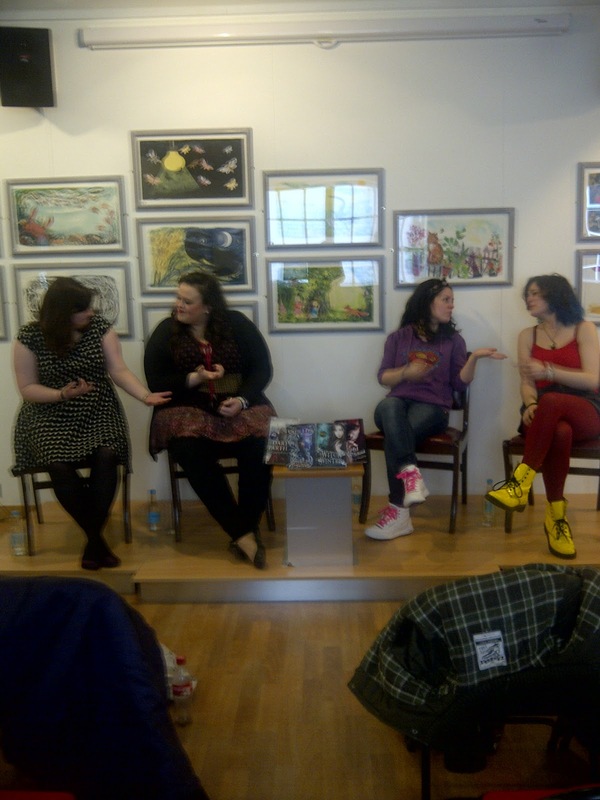 Thank you Foyles for bringing the authors to the readers! Sounds like you had a fantastic time - I was really disappointed I couldn't make it. haha that sounds like me when i met Becca Fitzpatrick.. i couldn't think of what to say! i was so shocked :) best night though. Glad to hear I am not alone on this one. LOL. Oh my gosh Viv, this sounds wonderful. I'm happy for you on getting to meet fav authors. Thank you! It was an awesome event. How awesome Viv and so great that you got to meet Amy! You're lucky - none of the good authors come to my neck of the woods. I am sorry to hear that Dar. We forget how lucky we are in the UK. I love that she recognized you in the audience like that! awww Viv, I loved seeing you after you'd met Amy, you were all wide-eyed and awe-struck! :) Great write up… I need to do mine!